IFC Markets, incepted in 2006, is among the heralds of trading on the international financial markets, providing trading services in Forex, commodity CFDs, futures, stocks, and indices. Serving over 60 countries across the globe in 18 languages, the FX brokerage has been sternly adhering to international standards. IFC Markets belongs to the IFCM Group, which comprises a group of companies, revolving around developing and implementing new-fangled, effective projects in the area of financial technologies for over 10 years. Since 2006, the Group has been offering to its clients services for financial instruments’ trading both on regulated markets and beyond by making use of trading platforms, such as MetaTrader 4, MetaTrader 5, and NetTradeX. Finding its command centre on the British Virgin Islands, IFC Markets is licenced and sternly regulated by the Financial Services Commission of the British jurisdiction. IFCM Group activities abide by the unified prerequisites set forth by international legislation for offering financial and brokerage services. With 500+ trading instruments, any trade size, the tightest fixed spreads, as well as an instant execution and continuous CFDs, IFC Markets punches its financial weight among the gargantuans in the industry. Taking into careful consideration the necessities of every single customer, IFC Markets has crafted numerous trading accounts, depending on the trading platforms. 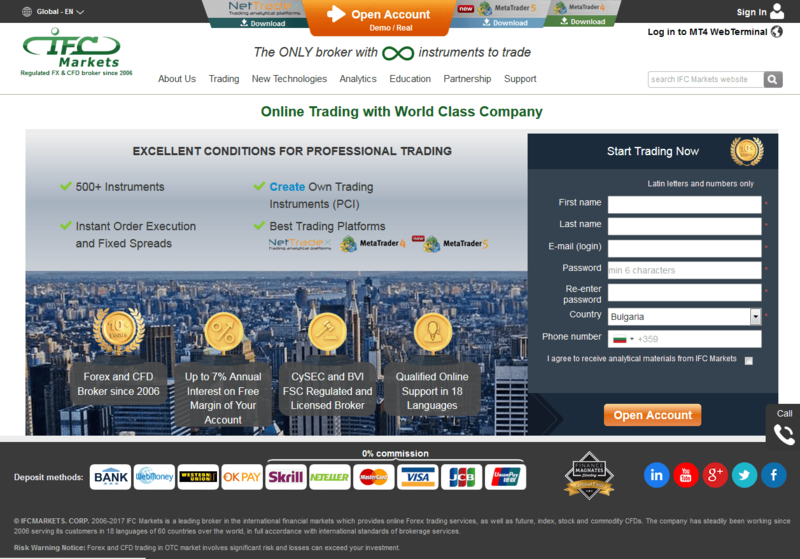 NetTradeX’s trading accounts encompass a Standard-Fixed, a Beginner-Fixed, a Demo-Fixed, and a Demo-Floating account. The balance currencies for all of them are EUR, USD, and JPY and save for the Demo-Floating account, all other accounts have a fixed spread. The leverage of the Standard-Fixed account amounts to 200:1, while the maximum level of the leverage for all other accounts is 400:1. 100 units is the minimum deal volume for all accounts except for the Standard-Fixed where that volume is 10,000 units. The Beginner-Fixed account has a set maximum equity to the tune of 5,000 USD/EUR or 500,000 JPY. All other accounts do not have a maximum equity. The live accounts possess a market newsline, but the demo ones do not. The Stop out level for all accounts is 10%. The accounts for MetaTrader 4 are three (3) – a Standard-Fixed, a Micro-Fixed, and a Demo-Fixed. The three MT4 accounts derive advantage from a 10% Stop out level, fixed spreads, and USD, EUR, and JPY as base currencies. Only the Micro-Fixed account is limited by a maximum equity of 500,000 or JPY 5,000 USD/EUR. The leverage for MT4’s Standard account is 200:1, while for the Demo and Micro, the maximum level is 400:1. The minimum deal volume for the Standard-Fixed account is 0.1 lot, which differs from 0.01 lot that’s the set minimum for the Micro and Demo accounts. The MetaTrader 5 accounts are Standard-Floating, Demo-Floating, and Micro-Floating. As per the name, they all pride themselves on a floating spread. The Demo account on this trading platform benefits from a 400:1 max leverage, 10% Stop out level, a minimum deal volume of 0.01 lot, and USD, JPY, and EUR as balance currencies. All the accounts at the three platforms can be converted into an Islamic account. Swaps there are not calculated. IFC Markets is one of the few FX trading forerunners that provides its respected customers with three (3) trading platforms. The NetTradeX and the MetaTrader 4 and 5 have a couple of similar functions, but they also differ in numerous aspects. The three trading platforms of IFC Markets all have linked and pending orders, as well as locked positions and the ability to explore a detailed balance & trading history. NetTradeX boasts the following amazing features: OCO (One cancels other) orders, Activated Traders, Personal Composite Instruments, and Trailing Stop on server side. OCO orders mean that two orders are connected and should one of the orders be executed, the other one is automatically deleted. The “Personal composite instruments” option gives investors the ability to construct and trade personal composite instruments, as well as build charts. In terms of analytical options, NetTradeX is the only platform that provides IFC Markets’ customers with the option to show multiple instruments on the same chart. The MT4 and MT5 derive benefits from trading signals, which gives the opportunity to both become a subscriber for or a provider of trading signals. While the order volumes for NetTradeX are 0.01 units (or 0.0000001 lot), for the MT accounts, the position and order volumes amount to 1,000 units (or 0.01 lot). A distinctive feature of MetaTrader 5 is the trading mode where positions can be combined into one. To ensure all its clients sleep well, IFC Markets has devoted itself to forging security like no other. Customers can easily engage in trading, being cognizant of the fact that the FX brokerage adheres to all international standards for broker services. Its 10+ experience and stern regulation by the Financial Services Commission further speak of its online safety. In the unfortunate event of encountering problems while trading, make sure to contact IFC Markets’ impeccable support centre. Not only there are the standard contact options – live help, e-mail support, and phone assistance – but there are Skype, Telegram, and WhatsApp support, too. And don’t forget that you are capable of requesting a call back. The website of the innovative brokerage comes in various world languages, including English, Russian, Hindi, Indonesian, Arabic, Spanish, Japanese, Vietnamese, Turkish, French, Farsi, Portuguese, German, Taiwanese, Italian, Czech, Malaysian, and Chinese. When it comes to initiating deposits, IFC Markets pleasantly surprises its customers by presenting them with tonnes of options to do so. They include Wire Transfer, Local Bank Transfer in Japan, China Union Pay, Bank Cards (JCB, VISA, and MasterCard), as well as electronic payment systems (WebMoney, Western Union, Skrill, NETELLER, and OKPAY) and Internal Transfers. Western Union and local bank transfers in Japan usually necessitate around 1 day, wire transfers – 2-3 working days, while all other options are instantaneous. Skrill, NETELLER, China UnionPay, VISA, MasterCard, and JCB have 0% commission. Withdrawals at IFC Markets can be executed via a Wire Transfer, China UnionPay, WebMoney, OKPAY, Skrill, Western Union, NETELLER, and through Internal Transfer. If you have deposited by other means, the funds will be withdrawn to a personal bank account. Only internal transfers are free of charge. IFC Markets does provide bonuses as they take all positions of their revered clients to the interbank market. Nonetheless, they do offer up to 7% annual interest on your free margin. There is a monthly interest accrual, receiving funds is without any preset limits, and there is no min or max prerequisite for the deposit. *IFC Markets considers only closed positions. The FX broker does not have a refer-a-friend bonus, but if you want to refer friends, you can become its IB partner and receive commissions from your friends’ trading volumes (up to $15 for a total turnover of 1 standard lot). You can also obtain additional percentage from the commissions through your second level partners. Commissions are remunerated monthly and no upper or lower limitations on the commission reward exist.